There are many ways to connect to your love ones abroad and one of them is thru text message. A simple text to them means a lot when you're living far from your family and friends. 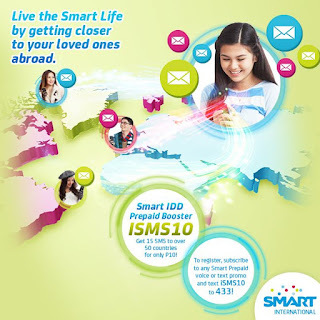 With Smart iSMS 10 promo, you can now connect via SMS for only 10 pesos. Send messages to over 50 countries around the world in an affordable way. To avail this promo you can register to this Smart prepaid international text service offer by following the mechanics below. There are lot ways of communication our love ones abroad. You can also try contacting them with the use of internet to send your messages and more.